" Set in 55 acres of rolling countryside with stunning views to Looe Island and the sea beyond." 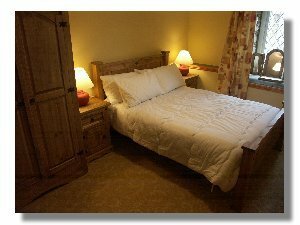 Facilities: Each cottage has: central heating, colour TV, DVD player and CD music system. Kitchens are equipped with: fridge with freezer compartment, microwave, fan assisted oven, gas hob, dishwasher, crockery and cutlery. There are enough pots, pans and cooking utensils to enable even the budding cordon bleu chef to create a culinary masterpiece! Bathrooms are equipped with bath with shower over and all have shaver sockets. Surroundings: Tregoad Park Cottages are set in 55 acres of rolling countryside which offers great views of Looe Island and the sea beyond. There is an adjoining rural campsite and small manor house and guests in our cottages are free to use the facilities which comprise a bar, bistro, games room, swimming pool and children’s play park. There are also Carp lakes for those keen on fishing. Looe Holiday Accommodation. Around and About: We are situated 1.5 miles from Looe and close to beaches, Polperro with its white washed cottages and delightful Fowey. Other attractions in South Cornwall such as The Eden Project and The Lost Gardens of Heligan are easily accessible. Tariff: We currently have two 3 bedroom cottages and three 2 bedroom cottages available for the 2006 season. From £contact us per week per cottage depending on season and size of cottage. Cottages are non smoking only and we are sorry but we cannot accept pets. Last Minute Breaks Special Offers and Short Breaks Off Season Breaks Please call our enquiry hotline on 01503 262718 "quoting Cornishlight" to check availability and special offers. For more detailed information and to enquire please call our enquiry hotline on 01503 262718 "quoting Cornishlight"